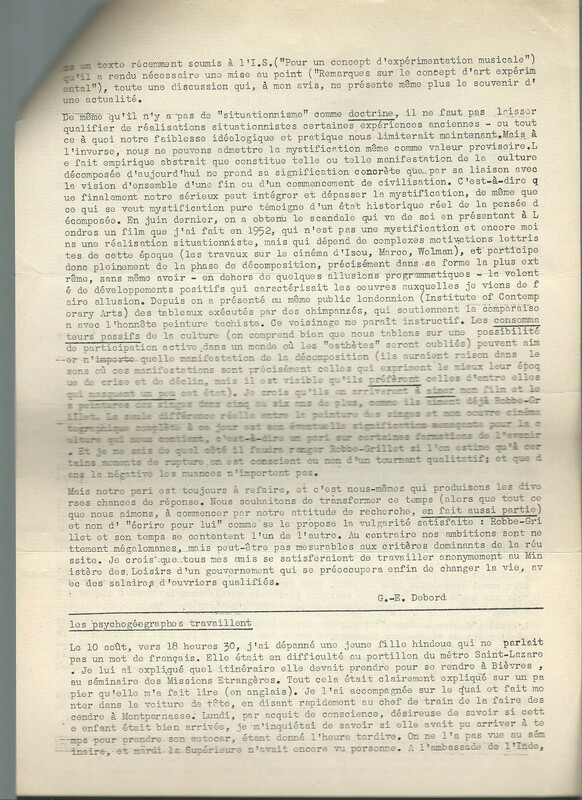 [Internationale Lettriste] Potlatch no.29: Bulletin d’Information de l’Internationale Situationniste. Paris: Internationale Situationniste, 5 Nov. 1957. 21 cm x 29.5 cm. 2 stapled brown sheets, printed both sides in black. 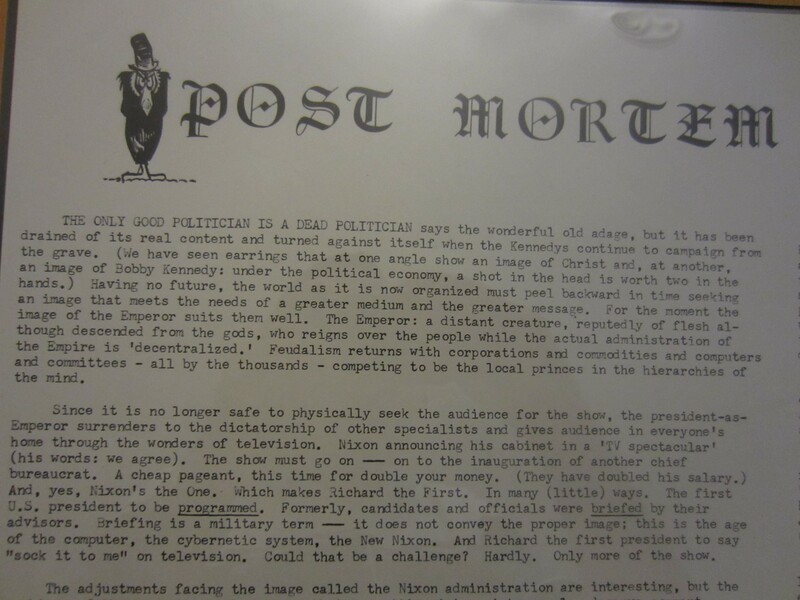 Potlatch was the newsletter of the Internationale Lettriste. 29 issues were published in Paris between 1954 and 1957. The newsletter’s title refers to the economic system practiced by some indigenous tribes, and which operates on the basis of the gift rather than market-based exchange (Ford). Indeed, Potlatch was never meant to be sold, only distributed to friends. Issue 29, featured here, is particularly important. 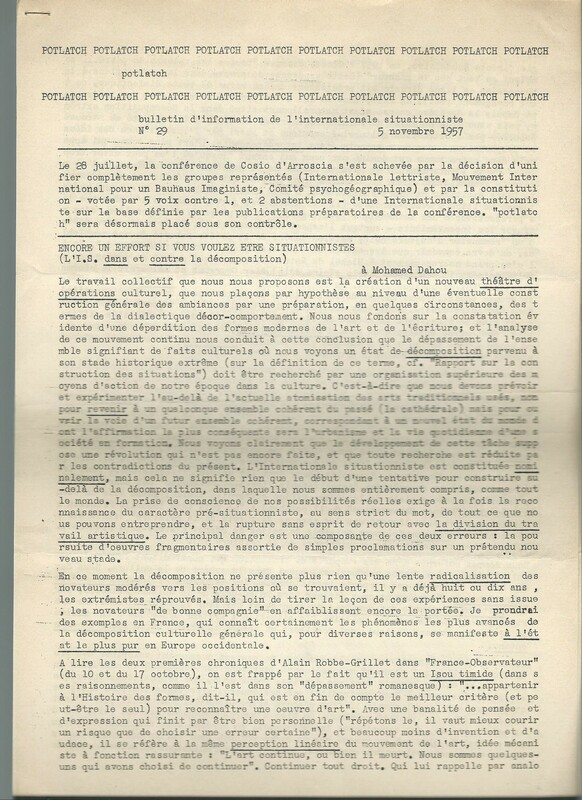 Whereas other issues state “Bulletin d’Information de l’Internationale Lettriste”, this penultimate issue is described as “Bulletin d’information de l’Internationale Situationniste”. This is because it was published in the aftermath of the Cosio d’Arroscia conference (28 July 1957), which marked the merger of the I.L. (and other movements) into the I.S. This key event is announced at the top of the first page. 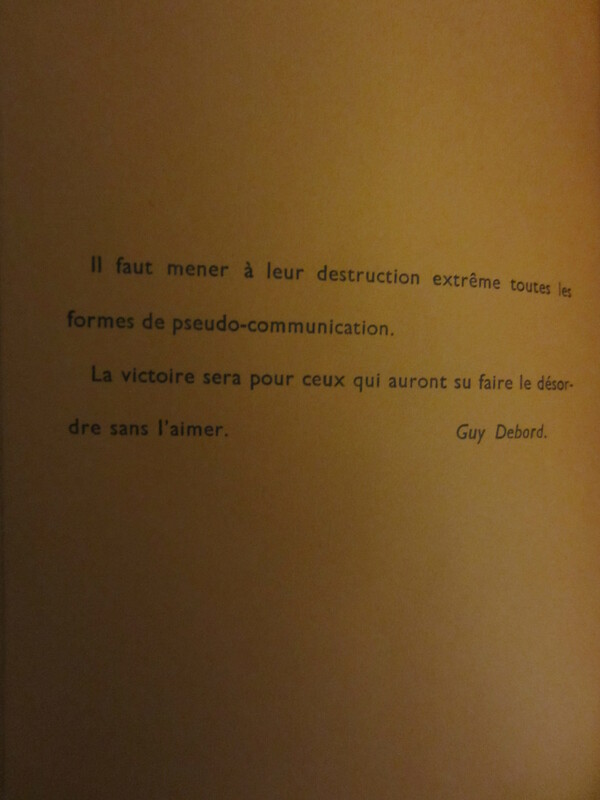 Issue 29 includes the famous text “Encore un effort si vous voulez etre situationnistes”, signed G-E Debord. 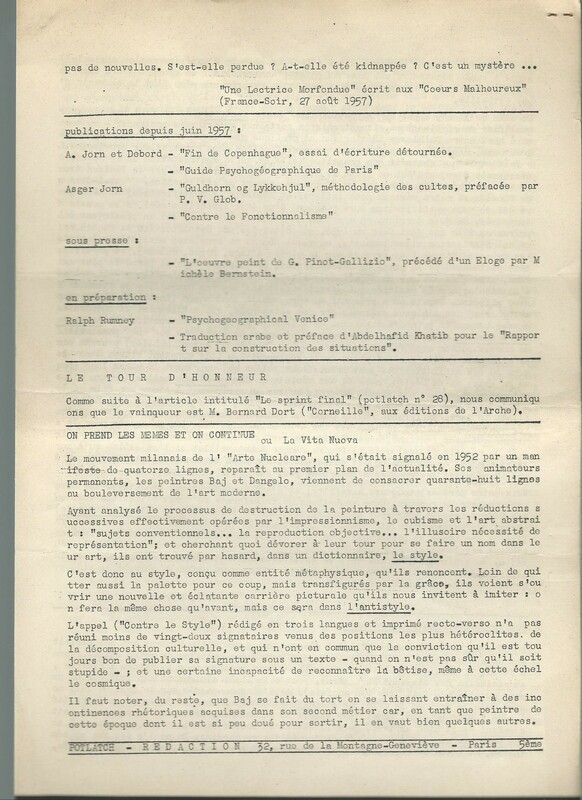 It also announces the publication of two very important pieces by Jorn and Debord: Fin de Copenhague and Guide Psychogéographique de Paris. George, Jean-Pierre. 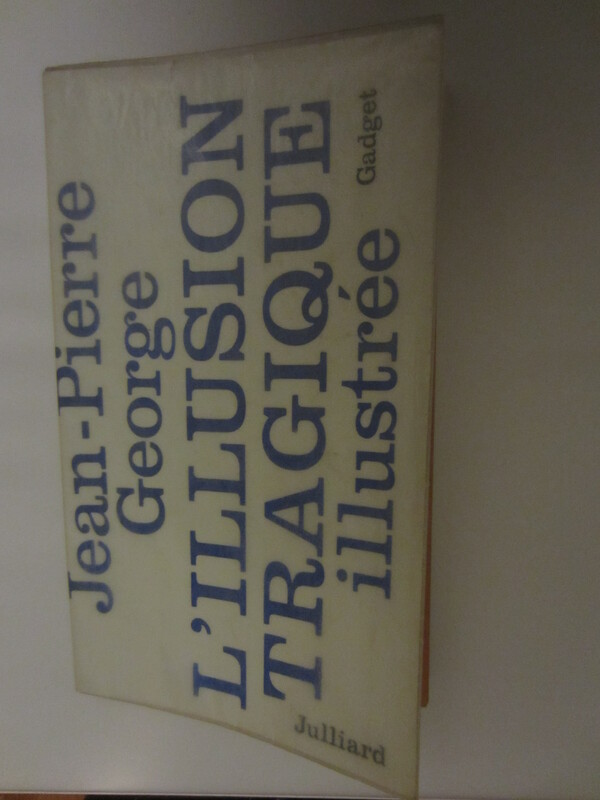 L’illusion Tragique Illustree: Gadget…Paris: Julliard, 1965. Book. 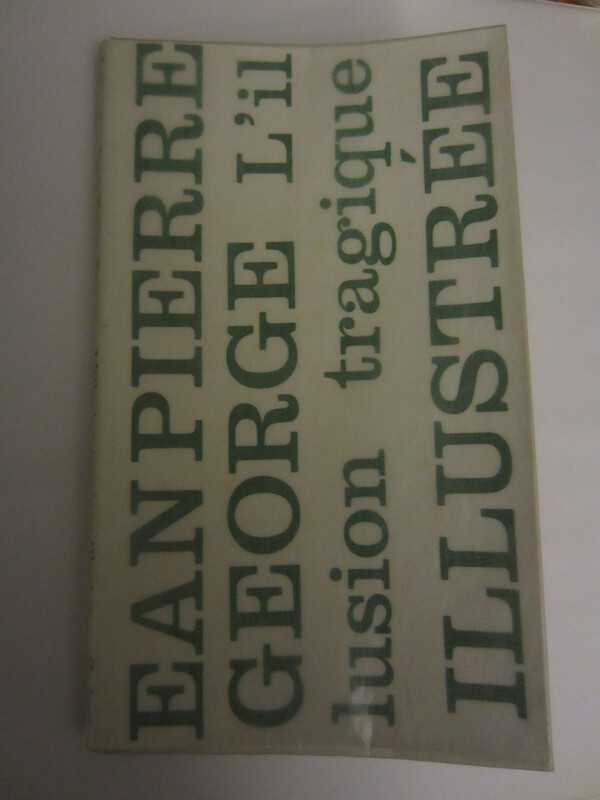 21 cm x 12 cm; printed cover in white with text in blue (front cover) and green (back cover). Inside text and illustrations printed in black on pink paper. Jean-Pierre George was influenced by Debord and the Internationale Situationniste in the 1960s, which was not very common at the time. The use of detourned comics, among other devices, is reminiscent of the I.S. 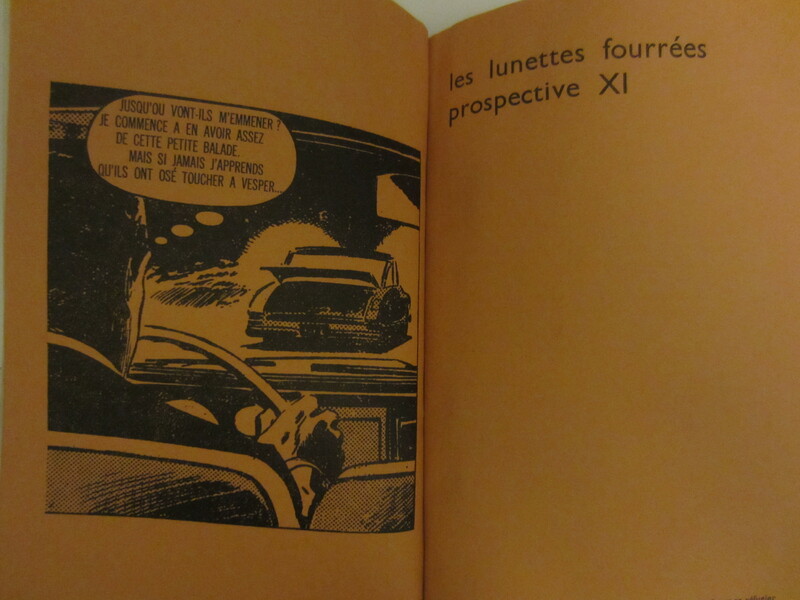 However, the appreciation was far from mutual: Raspaud & Voyer describe J-P George as “incohérent, à l”échine trop souple, signe à côté de Jean Cau” (43) The book’s covers are reproduced by Laurent Chollet in “L’Insurrection Situationniste” (336). In a short biography, Jean-Pierre is described as having flunked the baccalaureate twice (before passing on the third attempt) and never graduated from University. He refuses to work (“Ne Travaillez Jamais”?) and does not preach any morale. “Autopsie de Dieu” is his other Situ-influenced novel. [INTERNATIONALE SITUATIONNISTE]. Dans le decor spectaculaire…Paris: Internationale Situationniste, Dec. 1967. Poster. 37.5 cm x 56 cm; Printed recto in red and black on white paper. 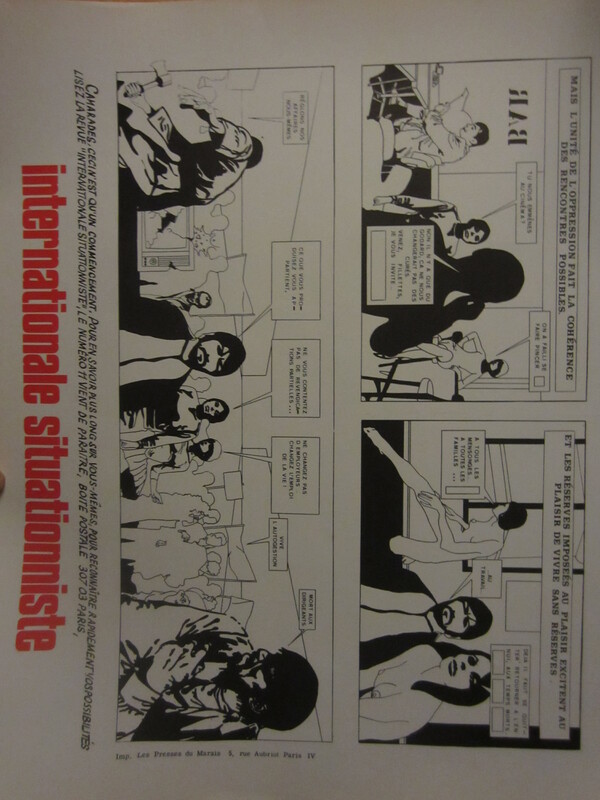 Detourned comic designed by André Bertrand announcing the upcoming publication of Internationale Situationniste no. 11. 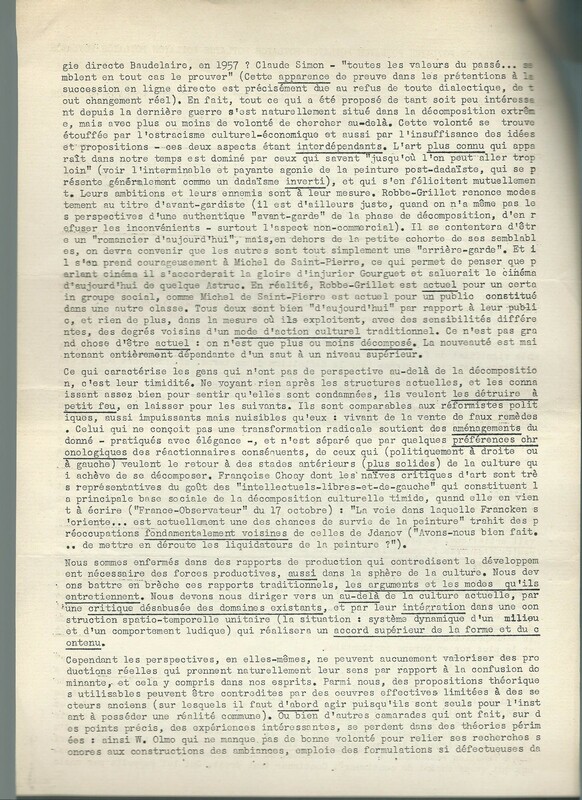 The unsigned text can be attributed to Raoul Vaneigem and reads as follows: “Dans le decor spectaculaire ou le regard ne rencontreque les choses et leur prix…rien ne manque au confort de l’ennui. Le bon usage du choix commence avec le refus de payer…”, etc. As noted by Raspaud (120-21, two different versions of this poster were released in December 1967, each with a similar unsigned text but illustrated with different comics. The other version is the work of Gerard Johannes, and is reproduced by Gonzalvez (136). 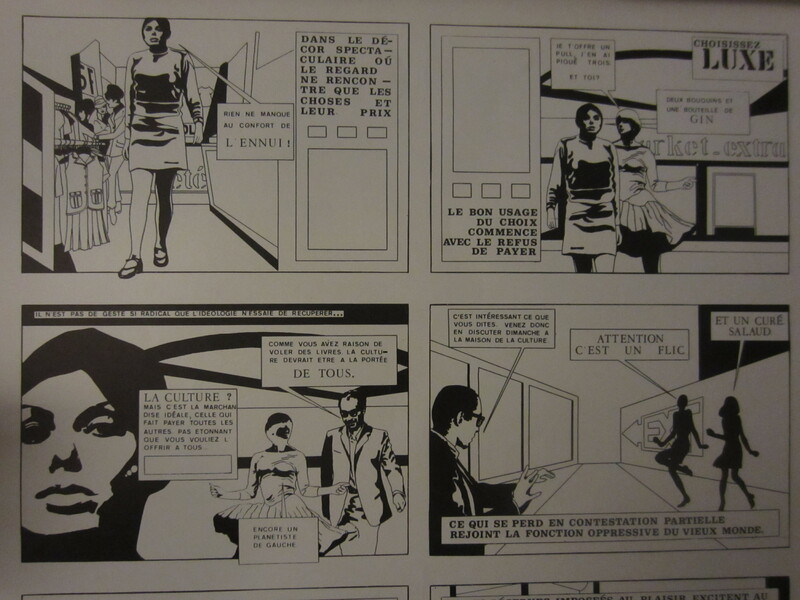 [BRUCE ELWELL] Situationist International. 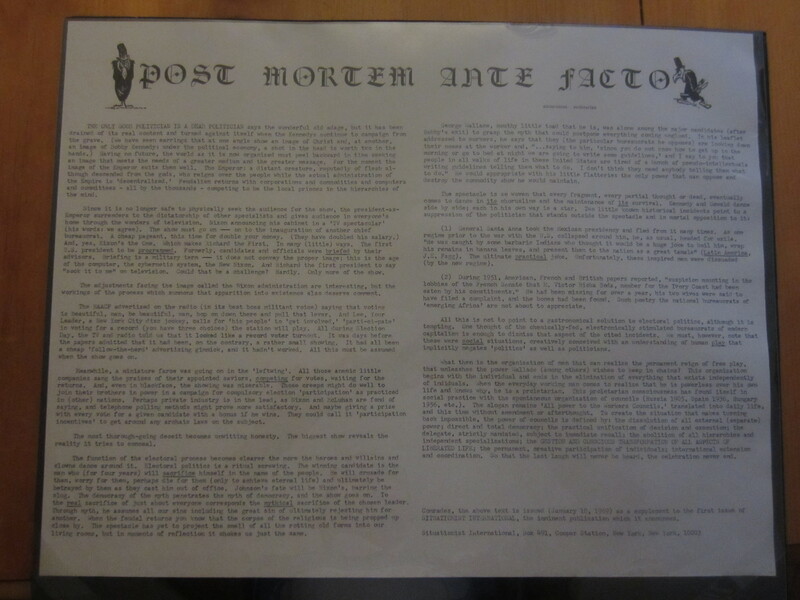 Post Mortem Ante Facto. 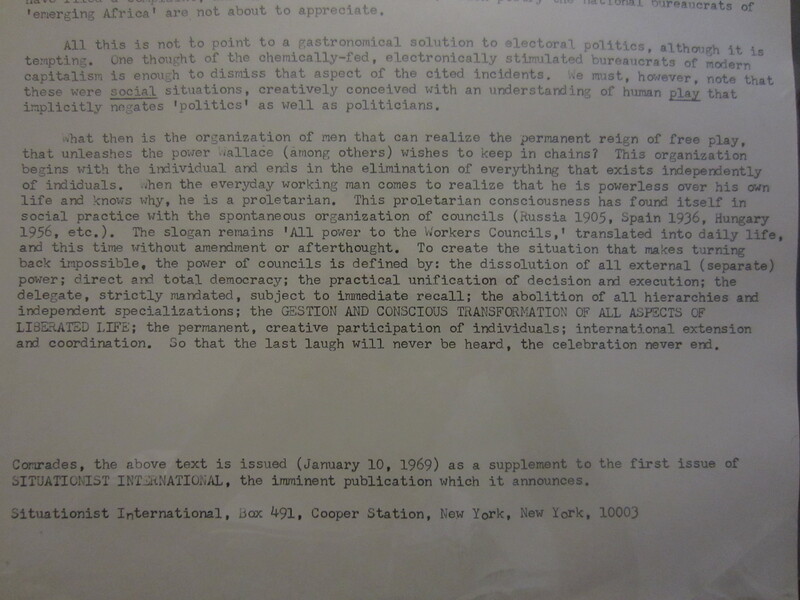 New York: Situationist International, Jan. 1969. Broadside. 44cm x 57cm; Printed offset in black on white uncoated lithograhic paper; text in two columns beneath headline in Gothic type. 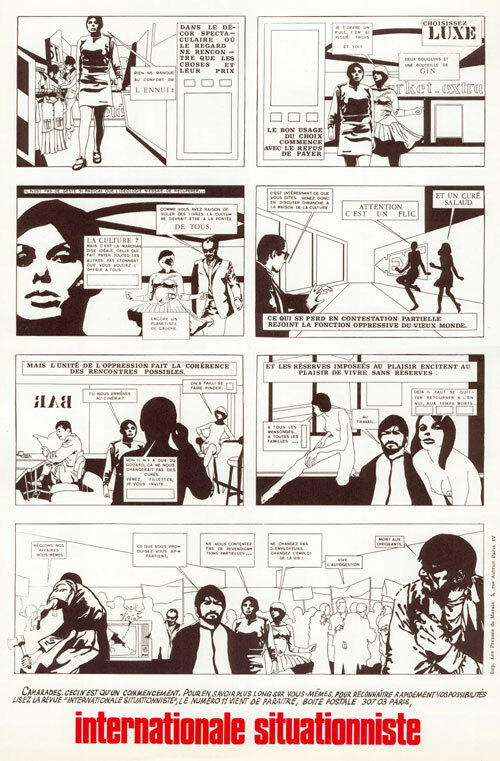 Issued January 10, 1969 as a “supplement” to the first issue of the American journal Situationist International, the imminent publication of which it announces. 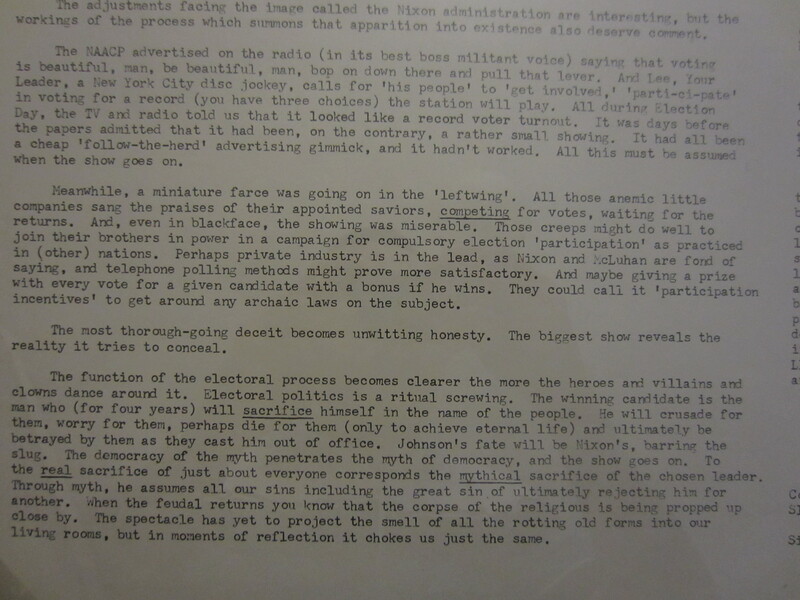 Possibly the first official pronouncement of the American Situationists following their admission to the SI in December, 1968. 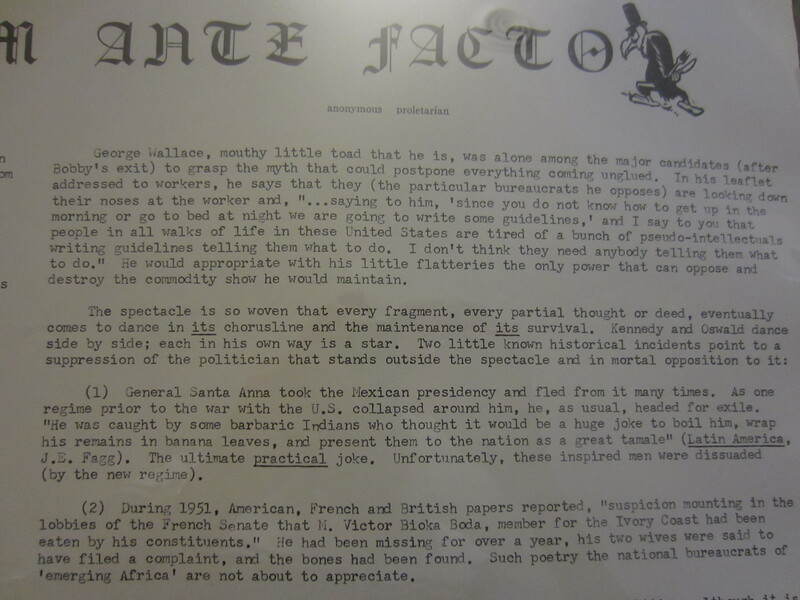 The purpose of this blog is to share some items from my collection of material around the Internationale Situationniste. Rather than sharing items that are viewed as expensive, I will focus on unusual editions and material. The collection will eventually be donated to a major library. Ce blog a pour vocation de donner un apercu de ma collection autour de l’Internationale Situationniste. Plutot que des ouvrages de valeur, je compte partager des editions ou textes rares. La collection fera l’objet d’un don a une bibliotheque specialisee en temps et en heure.